Creative. Engaging. Well written. These adjectives summarize well the fun steampunk novel, Nyssa Glass and the House of Mirrors by H. L. Burke. SUMMARY (From back): Nyssa Glass is a reformed cat burglar turned electrician’s apprentice, settled into a life repairing videophones and radio-sets. However, when her past comes calling, she finds herself forced into one last job. No one has entered Professor Dalhart’s secluded mansion in almost a decade, at least not and returned to tell the tale. If Nyssa wants to ensure her freedom, she’ll brave the booby trapped halls and mechanized maids. Nyssa has skills, but this house has more than its share of secrets. As she steps into the cobwebbed halls lined with dusty mirrors, she has to wonder. Is the House of Mirrors really abandoned? WHAT I THOUGHT: I’ve never read anything by H. L. Burke before but when she offered her latest release to me for an honest review, I thought I’d check it out and I’m glad I did, for this fun adventure did not disappoint. I love steampunk for the creativity authors show re: inventions in the Victorian era that could have been. This novel captured Burke’s vivid imagination as we find a house full of mirrors that feed data into a central computer. I love the imagery, for mirrors not only reflect ourselves, but more importantly, give sight and that’s the roll the host of mirrors throughout the old abandoned manor serve. In fact, after investigation, they reveal that the manor is not deserted at all. But what manner of beings does Nyssa, our protagonist, find inhabit the place? Now that is the question…and it won’t be what you expect, trust me, for it proved a great plot twist when I found out. The characters were well done as well. Our primary character, Nyssa Glass, is a spunky teen thrust into a situation not of her making. But this girl, who has a past she is trying to escape, proves quite the curious heroine as she befriends the house’s computer. I appreciated her resolve as well as ingenuity as she encounters obstacle after obstacle, but like McGyver, figures out a way through. If I had a complaint it would be with this character for Nyssa’s seeming lacks of response to a horrific murder she witnesses as well as lack of an emotional response to who/what she finds in the house. seemed odd. If I put myself in these situations, I would have totally freaked, but Nyssa puts on a stiff upper lip of sorts and under reacts. That’s not a big detraction from the narrative for she is very much an analytical, figure-things-out kind of character, but I thought Burke could have made her a bit more emotional. Overall, I give this book 4.5 stars! 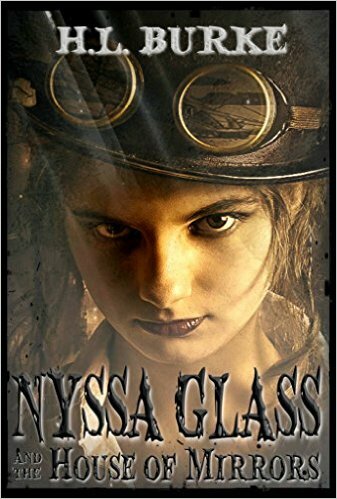 Nyssa Glass and the House of Mirrors will release on March 20th and if you pre-order before March 14th you can get it for just $.99. It will retail for $3.99 after that. Buy book at Amazon now! ABOUT THE AUTHOR: Born in a small town in north central Oregon, H. L. Burke spent most of her childhood around trees and farm animals and was always accompanied by a book. Growing up with epic heroes from Middle Earth and Narnia keeping her company, she also became an incurable romantic. A lot of material nowadays has too great a content of graphic violence for my tastes, but this book sounds like it may lean away from that.